It is hosted by Webnames.ca (New York, New York City,) using Apache web server. 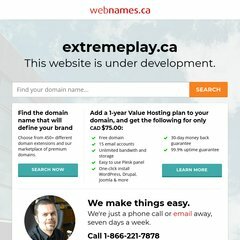 Extremeplay.ca's IP address is 64.34.130.218. It has 3 DNS records, ns3.webnames.ca, ns2.webnames.ca, & ns1.webnames.ca.